An automotive active purge pump is an electrified solution to reduce hydrocarbon evaporative emissions from the vehicle. The automotive active purge pump actively extracts hydrocarbon-laden air from the emission canister that is used to control evaporative hydrocarbon emissions in the vehicle. It is a part of the evaporative fuel processing system introduced by Continental AG, as a new advanced solution to meet stringent hydrocarbon evaporation norms and legislation around the world. Necessity to curb emission owing to the rising pollution caused by vehicle across the globe. This growing emission concerns can be handled through incorporation of the automotive active purge pump in vehicles. Governments of various nations around the world are constantly imposing stringent norms and regulation on the automotive industry in order to lower carbon emission, caused primarily due to gasoline or diesel vehicles. This is a major factor that is likely to drive the automotive active purge pump market during the forecast period. Gasoline fuel (petrol) is highly combustible and evaporates easily. The fumes exhausted contain benzene, when inhaled pose a health hazard. Furthermore, mega cities are witnessing increasing concerns about photochemical smog, which caused due to a combination of exhaust fumes and sunlight. Therefore, modern petrol vehicles have an on-board system to minimize hydrocarbon (HC) emissions. Increasing public preference and government emphasis and subsidies toward electric vehicles in recent years, due to emission concerns, is also expected to boost the global automotive active purge pump market during the forecast period. However, the automotive active purge pump possesses a few drawbacks, despite its numerous advantages. Introduction of battery operated electric vehicles and the increase in sales of these vehicles is a major restraint for the active purge pump market. Battery operated electric vehicles are zero emission vehicles which do not require an active purge pump. This is likely to hamper the automotive active purge pump market to some extent during the forecast period. In terms of material type, non-metal is a highly attractive segment and is expected to account for a prominent share of the market during the forecast period. Developments in the field of metallurgy (material technology) have led to regular replacement of metal components with non-metals. Non-metals are economical, flexible, and lightweight. Their high molding ability to form intricate shapes and designs, especially for casing, is expected to boost the non-metal segment for automotive active purge pump market during the forecast period. The DC motor is responsible for the actions performed by the automotive active purge pump, and hence, it is expected to offer lucrative opportunities. This in turn is projected to drive the global automotive active purge pump market during the forecast period. A brushless DC motor is used to power the automotive active purge pump. Moreover, the higher cost of the brushless DC motor is leading to higher market share of the segment. Hence, it is expected to witness significant expansion by 2026. In terms of manufacturing process, the vacuum forming segment is projected to expand at a prominent growth rate as compared to other manufacturing process segments during the forecast period. This is due to its ability to reduce cost of manufacturing product coupled with production time. For mass production, which is usually a part of the automotive industry, the vacuum forming manufacturing process is expected to witness considerable demand during the forecast period. The OEMs (original equipment manufacturers) sales channel segment held a major share of the automotive active purge pump market, as compared to the other segments, owing to the higher rate of adoption and imposing emission legislation on the automotive industry. Production of the pump is expected to begin by 2019. This, in turn, is anticipated to boost the OEMs segment –during the forecast period. The passenger vehicles segment is projected to dominate the market by 2026. The high market share held by the passenger vehicles segment is primarily ascribed to the increase in demand for passenger vehicles globally, primarily for intercity and local transport. The carry passenger vehicle segment witnessed expansion in terms of sales, owing to decline in car loan rates coupled with improved life standard in developing economies across the world. In terms of region, the automotive active purge pump market has been classified into five prominent regions. Among them, Europe dominated the global market and is projected to maintain its dominant position in the global market during the forecast period. This is due to the rise in awareness about emission and stringent emission standards, which have led to the high rate of adoption of the automotive active purge pump in the region. This trend is expected to continue during the forecast period. 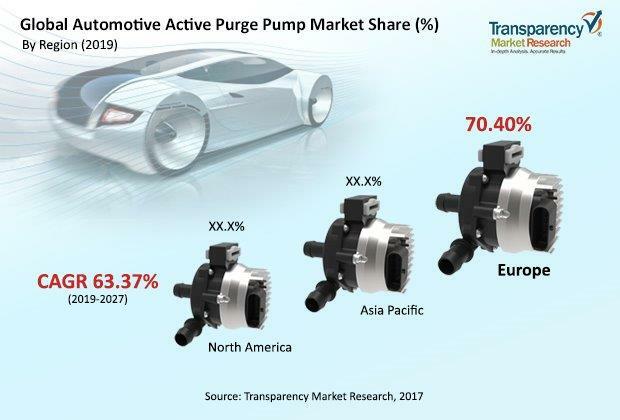 Europe being home to major automotive manufacturers is expected to remain a key market for automotive active purge pump. Developments in technology and availability of automotive components are expected to propel the demand for automotive active purge pumps during the forecast period. Rising sales of hybrid electric vehicles in the region, especially in Germany and France, are also anticipated to drive the demand for automotive active purge pumps during the forecast period. The global automotive active purge pump market is highly consolidated due to the presence of limited top manufacturers. Prominent players operating in the automotive active purge pump market include Continental AG and Agilent Technologies. Probable manufacturers of automotive active purge pumps include Robert Bosch GmbH and Denso Corporation. Continental AG are major suppliers of automotive active purge pumps. In 2017, Continental AG introduced active purge pump and has planned to start its production from 2019. Research and development in the field of evaporative fuel supply system is expected to boost sales of Continental AG for automotive active purge pumps. Progress and expansion in regions and development of next generation active purge system are expected to boost the market share for Continental AG. The report comprises a detailed value chain analysis, which provides a comprehensive view of the global automotive active purge pump market. The Porter’s five forces model for the automotive Active Purge Pump Market has also been included to help understand the competitive landscape in the market. The study encompasses market attractiveness analysis, wherein end-users are benchmarked based on their market size, growth rate, and general attractiveness. The study provides a decisive view of the global automotive active purge pump market, by segmenting it in terms of material type, components, manufacturing process, sales channel, vehicle type, and region. These segments have been analyzed based on present and future trends. Regional segmentation includes the current and forecast demand for automotive active purge pump in North America, Europe, Asia Pacific, Latin America, and Middle East & Africa. The report also covers demand for individual application segments in all the regions. The study includes profiles of major companies operating in the global automotive active purge pump market. Key players operating in the automotive active purge pump market include Continental AG, Agilent Technologies, Robert Bosch GmbH, and Denso Corporation. Market players have been profiled in terms of attributes such as company overview, financial overview, business strategies, recent developments, and SWOT analysis. The market for automotive active purge pump is primarily driven by the rising environmental awareness and emission regulation. The report provides the estimated market size of for automotive active purge pump for 2017, and Forecast for the next nine years. The global market size of for automotive active purge pump has been provided in terms of revenue and volume. Market numbers have been estimated based on key material type, component, manufacturing process, sales channel, vehicle type, and regional segments of automotive active purge pump market. Market size and Forecast for each major material type, component, manufacturing process, sales channel, and vehicle type have been provided in terms of global and regional/country markets.